If you read last month’s post, you will see we picked up some heavenly stone ground hazelnut flour whilst driving around France visiting food and wine farms. This flour is made from the by-product of producing Hazelnut oil, after grinding the nuts to a paste and then frying them to create a rich, golden oil. The flour has a toasted and chocolatey note to it, making it great to use for baking and as we are in the van, I am all about skillet cooking to get a ‘baked’ dessert without using an oven. This is not the prettiest dessert in town but you will find it is the most delicious, buttery, crumbly and fragrant Wintery dessert to eat hot and crunchy and straight from the pan when you want to indulge just a little and cozy up around a fire or heater. 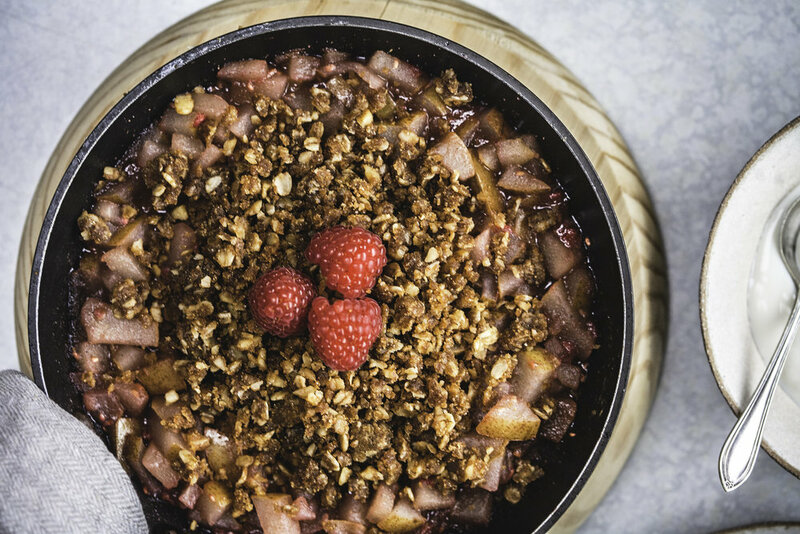 This crumble can be made in one pan or skillet, making it efficient if you are camping with limited water, or you could bake it in an oven if you are at home. 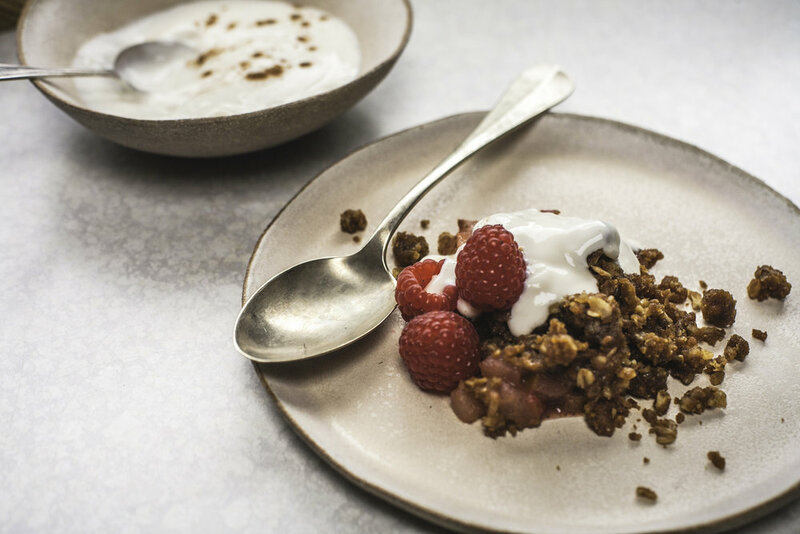 Here the recipe is designed for minimum fuss and maximum happiness, as only a good fruit crumble can deliver. A warm spiced sweet crumble to warm your Winter heart. Make the crumble first in the skillet. In a bowl, combine flour, nuts, sugar, salt and cinnamon. Melt butter in a medium sized skillet (23-25cm) over medium heat. Remove from heat and stir in maple syrup and then flour mix until small clumps form. Return to low heat, stirring frequently until crumble is golden and toasty (about 5-10 minutes). When done, slide onto a plate or board to cool and harden slighty. Now make the fruit compote in the skillet directly - no washing up! Stew all Pear Compote ingredients for 45 minutes to an hour until fruit is soft and the liquid is syrupy. Sprinkle over crumble mixture and allow to warm up for a minute or so. This is a wonderfully simple and delicious dessert but is so healthy that you could potentially eat it for breakfast or a decadent afternoon snack. The key is making the entire dish in the same skillet or frypan, save for a plate which can be used to eat off of after, making this a fun dessert to cook over the fire or place in the centre of the table and all tuck into with a bunch of spoons (and your traveling buddies).